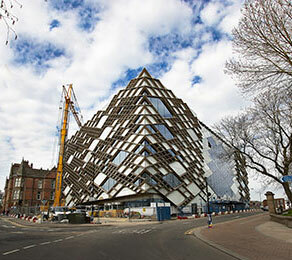 The £81m Diamond is designed to be the new home of the Faculty of Engineering at the University of Sheffield offering modern multidisciplinary teaching and learning. CCL was engaged to provide an alternative structural solution to the original voided reinforced concrete slab scheme. Objectives were to limit deflections to within architectural tolerance, reduce slab thickness which would result in construction material savings, and increase the speed of construction. The building’s frame is mostly reinforced concrete, with areas of steelwork to the atrium, which runs the full length of the building east to west. The flat slab construction comprises post-tensioned floors and traditional reinforced columns and walls. CCL designed and installed the post-tensioned flat slabs, from the first level to the fifth, including the roof, and transfer beams at level one. The company was able to reduce the original 500mm reinforced concrete voided floor slabs to 350mm PT flat slabs. Helical stairs comprising fabricated plate steps which cantilever from a tubular steel core, rise from the first to the fourth level. These are supported by the post-tensioned slab within the level one atrium area. Inclined columns support the atrium on level one. Two of these columns transfer out on seperate post-tensioned beams, which replace plate girders. Both beams have tapered geometry to accommodate the architectural headroom requirements. Each has its deepest section located directly below the supported column. Replicating the bending moment shape which highlights the engineering nature of the structure, the beams remain exposed and are visible from the lecture theatre below.